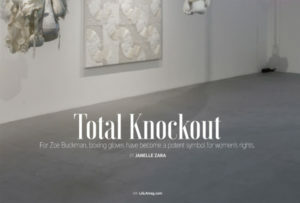 LALA Magazine, dedicated to the creators driving LA’s cultural development, featured Zoe Buckman in their Spring 2018 issue. The feature covered Buckman’s public sculpture, Champ, and her solo show at Gavlak Gallery, titled Let Her Rave. The magazine focuses on the significance of Buckman’s art in the context of art history, as well as the timeliness of her public sculpture.